Welcome to the world of "Deluxe Industrial Gases", where safety is redefined, redesigned and rediscovered to suit all your safety requirements. We protect your assets, offices, residence, server room, data centre, museums, libraries, stores, machines, manpower and above all your image. We thrive on technology, practical application, innovation and doing things differently. Innovative and market leading designs ensure that "Deluxe Industrial Gases", always provide cost-effective and reliable solutions to a wide range of System Integration applications. It is our assurance that we will be offering you a personalized service, and any call or problem will be attended within 24 hrs. Any clarifications regarding the product and services are always welcome. Argonite has been developed to meet the demands from the industry for an environmentally friendly media. Argonite is non-toxic, non-corrosive, non-fogging and leaves no residue. Argonite meets the challenge from both the Montreal- and Kyoto protocol with no ozone depletion potential or global warming potential. combustible materials and flammable liquids. high value risks where fi res can have devastating consequences way beyond the cost of damage and lost production. 15%. The Argonite fire extinguishing system, based on a mixture of 50%. We are leading supplier of CO2 Flooding. cylinders in liquid form with maximum filling ratio of 0.667 kg/liter of cylinder volume . At atmospheric pressure and 21 Degree Cel. Temperature ,1kg of liquid CO2 vaporizes to occupy 560 liters . This means that in o rder to flood/inject CO2 gas into an environment, causing volumetric reduction of oxygen gas concentration , a large quantity of CO2 gas can be effectively stored in liquid form in relatively small cylinder volume. The high pressure system operates on efficient pneumatic principles. Pneumatic pressure is used to open the valves and operate pressure switches , etc. No wires, pulley, equalizers or falling weights are used in this system. Operating parts are located internally, eliminating the need for bulky protective cages. Drawing offices . Plant Safes. In response to the impending production phase out of Halon fire extinguishants , FM-200 (Heptafluoropropane) is a replacement for Halon 1301 in applications requiring a clean environmentally acceptable fire extinguishing agent, suitable for use in manned areas. It is a colorless gas at standard conditions, exhibiting a boiling point of -16.4 Degree Centigrade. Through the use of properly designed equipment, FM-200 will mix well in a protected enclosure to provide a homogenous mixture in air. 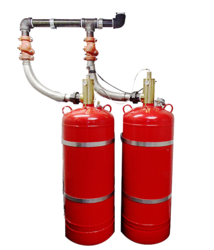 For fire suppression applications, FM-200 is super pressurized to achieve rapid discharge into the protected environment. We are offering NOVEC System to our clients. We provide high-quality products to our clients. The widest margin of safety because its use concentration is much lower than its No Observable Adverse Effects Level (NOAEL), Novec 1230 fluid offers the widest margin of safety of any viable halon replacement available on the market today. Note: Industry standards require egress from a protected enclosure prior to system discharge. Safety Margin 67-150% Nil Nil 3-20% 3 NOAEL for cardiac sensitization. 4 NOAEL for acute toxicity, including cardiac sensitization. One fire protection fluid. So many reasons to use it. Here is the new standard for halon replacement. Novec 1230 fluid offers a long-term, sustainable technology that has the greatest margin of safety, the lowest GWP for halocarbon alternatives, and zero ozone depletion potential. 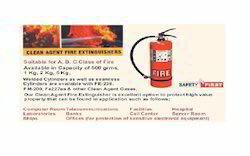 We are offering a wide range of Fire fighting equipment. Computer room telecommunicatin facilities Hospital Laboratories, banks, Call center , Server Room, Ships, office . 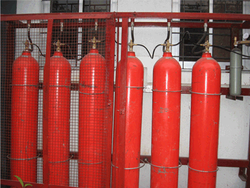 The Fire Fighting Extinguishers operates on efficient pneumatic principles. Pneumatic pressure is used to open the valves and operate pressure switches , etc. No wires, pulley, equalizers or falling weights are used in this system. Operating parts are located internally, eliminating the need for bulky protective cages. 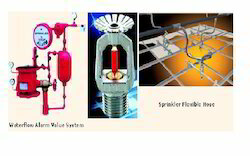 We are offering a range of Fire fighting fire hydrant & Sprinkler system. 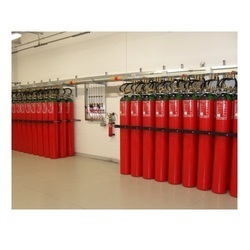 We design ,supply and install hydrant and sprinkler system in the Factory ,Plant ,Offices ,Malls and Buildings as per the government norms .Fire Hydrant is useful where the fire has already reached the critical stage and is spreading fast. Looking for Co2 Supression system ?